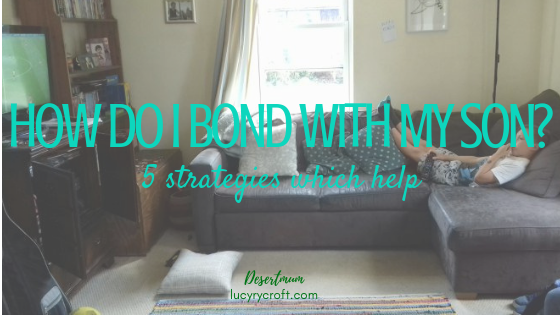 One of my (many) recent struggles is: how do I bond with my son? A year ago, my son moved from Year 2 to Year 3. I thought this was simply a matter of moving up a year, like Year 1 to 2. Apparently not. There’s been a noticeable change in my son’s attitude – and my friends say the same about their sons too. These 8-year-olds are displaying more sulkiness, stroppiness, rudeness and even aggression. Mister’s teacher taught his class in Year 1. Although she’s enjoyed having them both years (and done a great job both times), she’s reported increased confidence and cheekiness. In short, they’re more likely to tell her when she’s made a mistake! This change in attitude has given us a new challenge as parents. How do we establish boundaries? Should my son have his say in what he is and isn’t allowed? What discipline measures are effective? The fact that my son is not turning into me doesn’t come as a surprise – but I’m absolutely determined not to lose the relationship we’ve spent nearly nine years building. For Mister’s first two years we did everything together. We went to groups, did baby yoga and massage, swam together, and made new friends. The two of us hosted playdates, and went to play at others’ homes. We even hill-walked together on one occasion, just me and him. Even with the addition of his sister, and later his brothers, I don’t think there’s anyone he’s spent more time with than me, nor I him, over the course of his life. Mister and I have too much history. We were best buds from day one, and he taught me how to be a Mum. So – what do I do? How do I bond with my son when he starts to drift away from being Mummy’s boy? Can we keep communication open so that boundaries can be discussed, negotiated and established? How do we stay close so that when adolescence hits, they still have a secure base to turn to? I’ll admit I don’t have many answers. Please fire away in the comments, as I’d love to get some wisdom here! But here are a few things I’ve noticed in the last few months. I’m grateful that, way back before we got to this stage, our family established daily shared rhythms. For example, we always eat our evening meal together at the table, and we always read the kids a bedtime story. It might not seem like much, but these two simple acts ensure that, every day, I’m connecting meaningfully and positively with my son at least once or twice. Of course, we usually connect more than that, but for those days where we’re just not speaking the same language, at least we still have meals and story time. Mister has definitely made the switch from wanting me around to wanting his Dad around. He shares more interests with his Dad, and connects more easily. For those of you who are single Mums to young sons, I encourage you to find some great male role models now so that, as your boy grows, he will have some people to relate to and let off steam with, when he can’t do that so easily with you. But don’t delegate everything to Dad/other male role models! Even when he’s reluctant, I still make regular effort to converse with/hug/connect with my son. He won’t do it in front of his friends, but when we’re at home, he often asks to hold my hand, cuddle or kiss. Boys still need – and love – their Mums. Hooray for that! Yes, my son can be angsty and aggressive, shouty and rude. But, on the whole, he is a kind, thoughtful boy, who’s a great big brother and makes us proud every day. If I’m not careful, I become the kind of nagging mum who no one wants to confide in. 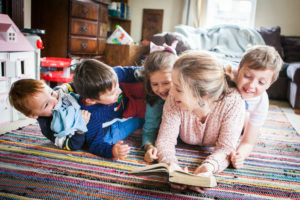 I’m not saying that we shouldn’t find ways of gently encouraging our boys to put their laundry in the basket or give us more than five minutes’ notice when they have homework due, but we can do this with grace and love, always remembering that our role is to teach our children these skills – they don’t just absorb them. Our family likes a bit of banter. OK, we like a lot of banter. And we’re pretty sarcastic. We frequently have to check with each other whether we actually meant something for real, or were just using sarcasm. But any banter at the expense of my son’s feelings is not good. Usually he enjoys being included in this way, and gives as good as he gets, but on occasion I’ve felt that we overstepped the mark in joking about something he’s passionate about. It’s easy to make fun of how much Mister loves geeky football videos or Roblux – but the reality is that he’s trying to work out who he is (and who he’s not). If my wisecracks are purely about trying to score points from those listening, if it’s all about making me sound like I’m witty and quick and cool, at the expense of my son’s feelings, then this needs to be stopped. I’m effectively saying ‘Your identity is wrong’ or even ‘My needs override yours’ and that is really hurtful. So I’m learning to raise up and encourage my son – particularly in front of others. Even if it kills me (and it hasn’t yet), if I have a few spare minutes when the other kids aren’t making demands I’ll sit with my son while he plays Minecraft or watches football, and ask questions and try and learn about his hobbies. This is kind of obvious good advice, I guess, and yet it’s so hard to actually put into practice when football is SO BORING and video games are SO NONSENSICAL. But have you ever been on a walking tour led by someone passionate about what they’re showing you round? I think we all catch someone’s excitement when their eyes light up and they explain a new idea to us enthusiastically. It’s like this with my son. If I listen carefully to what he’s saying, I’ll catch his excitement. Football, video games, or whatever he’s into that week, won’t be the boring stuff it used to be. It will be exciting, because my son is excited about it, and he is making me excited about it! Learning from our kids is actually really great, because they wouldn’t be here if it wasn’t for our love and nurture – and now look at them! Teaching us all kinds of things we’d never have known otherwise! Parenting Mister is a little harder this year than it was last year – but it’s us who need to adapt, not him. He is simply doing the hard work of growing up. We are here to love, support and guide him as he discovers the person he was made to be. Do you have, or have you had, an 8 year old boy? Does any of this resonate? What’s your advice? Oh that sounds lovely! And yes, hooray for games! I’m about to have a Year 3 boy, so I’ll watch with interest to see how the stroppiness develops. He’s already had a couple of times when he’s been pushing boundaries, and I’ve learned waaaay too much about cars and Mariokart already!